Small business owners face the job of making sure that all of their accounting procedures are conducted as efficiently and accurately as possible. On the whole, company owners have to make a choice between a manual accounting method or accounting software programs. An accounting software system has many major advantages towards achieving faster growth in a company. More and more companies are choosing to use this method for the following reasons. 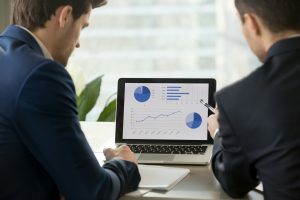 One of the most important advantages provided by computerized accounting software is that it can save huge amounts of time for small business owners. They can easily make calculations for operations such as billing and payroll performed efficiently and quickly just by using accounting software programs intended for small businesses. They can also have access to their accounting records swiftly without having to go through huge files of paper. Businesses can give more time to their customers and focus more on their marketing functions which will help their business grow further. Manually “number crunching” presents opportunity for human error. This error can be costly for any small company owner who happens to be in a rush to finish an accounting task. Calculation errors can occur due to inaccurate inventory counts, incorrect total sales receipts, along with many other reasons. With the help of computerized accounting programs and software, there is a drastic reduction in calculation errors. If you have accurate accounting information, it will also help you escape any tax blunders that could possibly lead to complications and difficulties with the Internal Revenue Service. Using an accounting software in a business helps centralize and unify many aspects of the business’s financial management. A small business owner will easily be able to undertake tasks such as payroll, invoicing, inventory management, and some sides of customer relationship management, all from an accounting software program. A business owner will save money and time because of centralization as long as the owner does not need to buy separate software programs in order to perform operations such as invoicing customers. Besides presenting the amount of tax that is to be paid on particular invoices, accounting software also aids the business owner in preparing reports. An example of this scenario can be the amount of a particular tax the business owner has been paying during the course of a certain period. Also, accounting software makes it a lot easier to collect the information needed to complete and apply for essential government tax forms. If a business owner uses an accounting software, it will be just like having their own in-house financial consultant. The customizable reports will allow the owner to analyze and examine various aspects of the business as well as provide the information and statistics needed to make better and more informed financial judgments. Reports, such as a balance sheet, help summarize exactly just how well the business is doing.